This popular model can operate a wide variety of appliances, making it perfect for portable use at home, camping, or on the jobsite. Run time of 8 hrs @ 1/4 load (3.4hr @ rated load). Uses a recoil start system. Residential and commercial warranty of 3 years! Need more power? 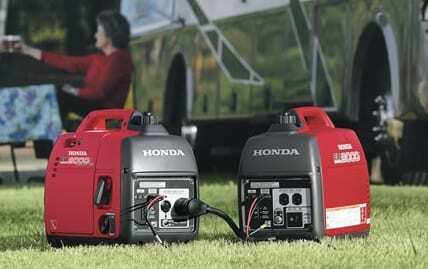 Join two identical Honda EU2000i companion generators with a cable or cord for up to 4000 watts of power. Features advanced inverter technology – reliable power for computers and other sensitive equipment.